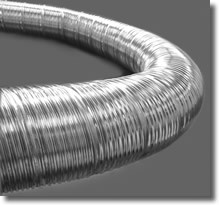 Forever Flex is a premium chimney liner priced at industry low prices. It is made with the installer in mind for easy installation and uses their "Quick-connect" clamp system which means no more drilling, screws or rivets. It has passed ull UL testing to the UL 1777 standard and comes with an industry exclusive "Forever Warranty". The liner and all components are high quality 316Ti alloy. Click here for the Foreverflex installation manual with spec sheet. No sag / No leak 13"x13" top plate (standard), No sag / No leak 13"x18" top plate, No sag / No leak 18"x18" top plate, Flat top plate 13"x13", Flat top plate 13"x18", Flat top plate 18"x18"
Just choose from the drop down boxes on the item page before adding it to the cart. If other substitutions are needed please contact up for a custom quote. Prices are for kits with no insulation package. Please read our F.A.Q. for the importance of a properly insulated liner.